Successfully Added 3D Virtual Screen Video Glasses "Eye-Theater" - 98 Inch LCD Display, 854x480, 8GB Internal Memory to your Shopping Cart. 3D Virtual Screen Video Glasses provides a simulated 98 Inch LCD Display with a resolution of 854x480 as well as having 8GB Internal Memory for saving your movies that you can watch whenever you want in stunnning 3D or 2D. 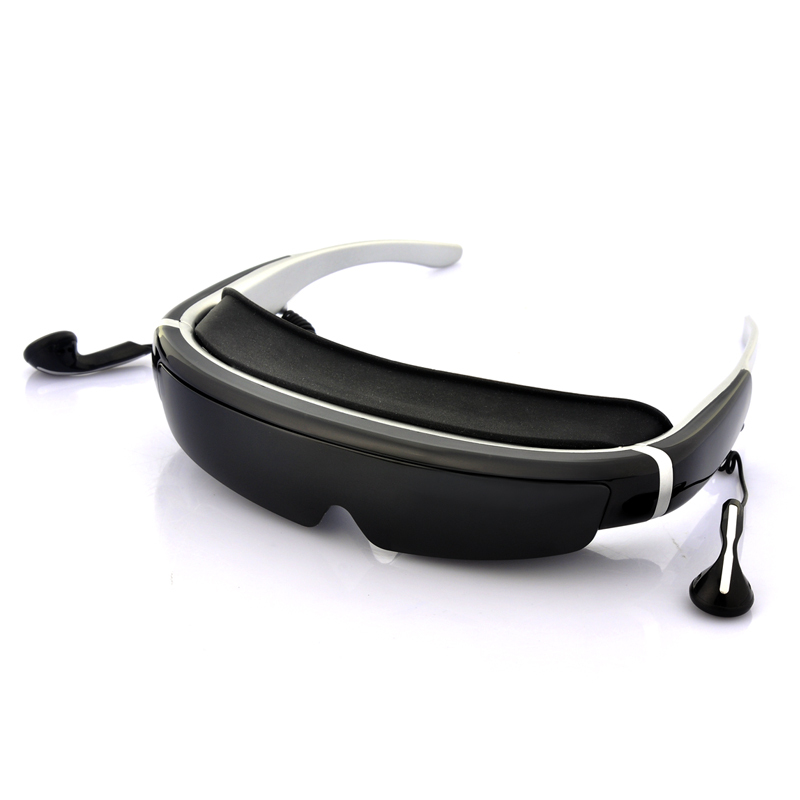 A cool, modern and mobile way to watch and listen to your media library when on the move is these virtual screen video glasses that are known as the “Eye-Theater”. 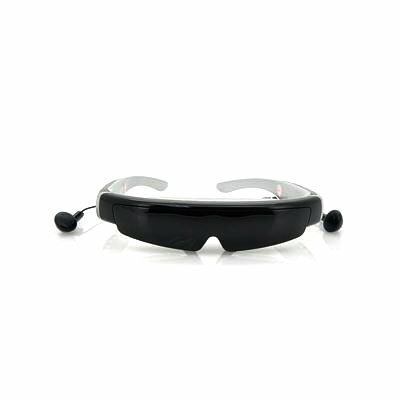 Providing a remarkable simulated 98 inch wide view capabilities, the “Eye-Theater are true 3D video playing glasses that will make watching media more pleasurable. You can enjoy both 2D and 3D movies via the ‘side by side’ function of the “Eye-Theater”; the ‘side-by-side function shows two separate videos that are combined by means of a switch on the 3D glasses. With a ratio of 16:9 combined with the 98 inch simulated display size, you will feel you are at a distance of 1.5 meters away from the screen when in actual fact you are wearing these just like regular glasses. Make travelling more fun on the bus to work or on a train to a new location as they can fit in your bag as they are similar size to that of regular glasses. Having a built-in battery allows for the “Eye-Theater” to be worn wherever as it can last up to 3 to 4 hours without the need for a recharge. Boasting 8GB of internal memory means that you can save and store media on these video glasses to watch directly or if 8GB is not enough for your media library then you can insert a micro SD card of up to 32GB for additional storage space. In addition, the glasses themselves are lightweight in design, fashionable in appearance and are comfortable so that they can be worn for extended periods of time. The “Eye-Theater” 3D virtual screen video glasses offer the user the capability to enjoy a cinematic experience with surround sound that can be worn like any other piece of eyewear. This excellent industry leading portable 3D cinema screen video glass with great optical and sound quality makes listening and watching media an absolute joy. The “Eye-Theater” supports a vast range of different media including video formats such as TS, AVI, MP4, MPG, MKV, PSP, DAT, VOB, WMV, ASF, PMP, MOV, M2V, QT and M2A. Built-in headphones are an additional feature that the “Eye-Theater has”, therefore it is possible to not only watch but also listen to your videos as well as other music formats like MP3, WMA, FLAC, APE, AAC, and PlayFX . The “Eye-Theater” isn’t just limited to videos and music as you can also view JPEG, BMP and GIF images in private. The “Eye-Theater” allow you to enjoy media when on the go in a unique and personal style. This product is in stock and can be dispatched within one working day of ordering with a 12 month warranty. Brought to you by the leaders in wholesale electronics and home theaters, Chinavasion.